Light Transmitting Panel Fall Screens | R&S Manufacturing and Sales Co.
Flat Light Transmitting Panel (LTP) Skylights are often installed on metal building roofs. These skylights are a fall hazard when safe guards are not present. R&S SafeScreen Light Transmitting Panel Fall Screens are designed to fit any Standing Seam or Panel Rib. 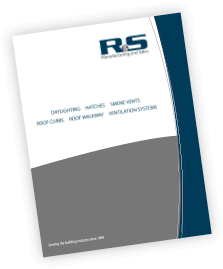 This fall protection system provides protection against a fall accident through flat skylights. All screens are tested to meet OSHA Skylight Fall Protection Standards and install in 30 minutes or less. Clean and Professional Look - 20-Year Warranty! Example: SCRN-GAL-4896-LPR: fall protection screen for an R-panel roof system.